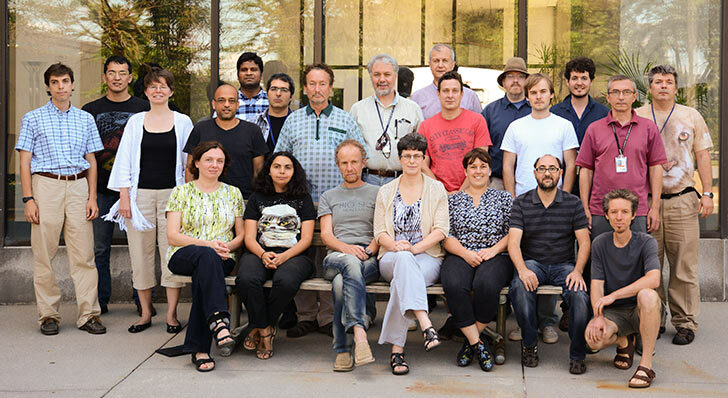 Koonin (seated, third from left) and with his evolutionary genomics research group at NCBI. So begins the statement of research interests for NCBI’s Evolutionary Genomics Research Group, headed by Eugene Koonin, PhD. It’s a lofty, even audacious, goal, perhaps not fully achievable, but the progress toward it has the potential to uncover amazing things. Since the late 1990s, Koonin and his team have proposed theoretical models and uncovered genetic elements that have propelled biotechnology forward. Among their notable work is that related to the CRISPR system, a revolutionary tool for editing DNA that was used recently by researchers in Oregon to fix a heart-damaging genetic defect in human embryos. Koonin, working together with NIH-funded researcher Feng Zhang, of the Broad Institute and MIT, has identified several distinct, new variants of CRISPR systems. Perhaps even more exciting—the computational approach that led to those discoveries can potentially unlock more. The repeating gene sequences and distinct pattern that comprise CRISPR were first discovered in bacteria in 1987, but no one knew what they meant. Since then, CRISPR-based research has advanced quickly. Researchers discovered that CRISPR sequences were part of a system bacteria use to defend against invading viruses. Bacteria with CRISPR-based immune systems recognize viruses they were previously exposed to and command proteins to attack, cutting their DNA strands so the virus cannot replicate. 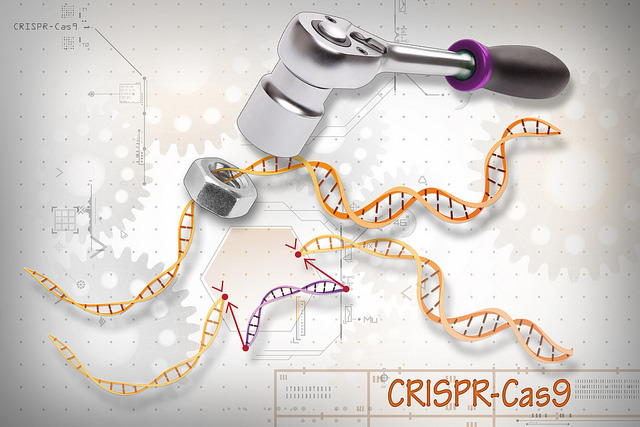 The job of cutting the DNA, scientists learned, fell to specific enzymes, and these enzymes resulted from specific genes—dubbed Cas, for CRISPR-associated genes—that were always near a CRISPR sequence. The precision and effectiveness of the CRISPR-Cas combo outpaced any genetic engineering tool science had known up to that point, so it was only a matter of time before researchers learned to control it. The first step in 2012 involved snipping a microbe’s DNA at a precise location using Cas9. The next step came quickly, cutting a specific piece of human DNA and replacing it with another in 2013. The pace hasn’t slowed since. Scientists have shown that the CRISPR-Cas system can be used as a programmable editing tool, efficiently and precisely modifying the genomes from mammals and other organisms. Thousands of labs now use it for a wide range of applications, including creating animal models for human diseases, identifying genes underlying biological processes, and modifying plants to increase yield. Then Shoukhrat Mitalipov, from Oregon Health & Science University, in collaboration with researchers at the Salk Institute in California and scientists from China and South Korea, took the humongous step of modifying the genetic material in a single-celled human embryo. NCBI’s ongoing discovery of new Cas systems multiplies those possibilities. And the way they discovered them suggests more are on the way. Koonin and his team use a computational strategy to examine large sets of DNA to locate CRISPR sequences similar to Cas9 and predict their function. Then Zhang’s lab at MIT put those predictions to the test. The Cpf1 enzyme discovered this way shows unexpected characteristics that can make it a powerful tool in bioengineering. It’s smaller, cuts DNA differently, and recognizes different types of strands, which means it can be put to different uses. The same computational approach allowed the team of collaborators to identify an entirely new type of CRISPR system, type VI, the first that specifically cleaves RNA rather than DNA. This system also demonstrates a peculiar property, which Koonin and his colleagues theoretically predicted: they seem to protect microbial populations from viruses via an altruistic suicide mechanism. Zhang’s lab has harnessed this property to develop a new method—tellingly dubbed SHERLOCK—to detect with unprecedented sensitivity specific RNA molecules. Such precision raises the possibility of useful, even groundbreaking, diagnostic applications. But Koonin and his team aren’t done yet. They continue to study the evolution of CRISPR-Cas and other microbial defense systems. And, because there are multiple ways to modify the search algorithm they run against NCBI’s genomic databases, they expect to discover additional distinct CRISPR-Cas systems in the future. As for how it all relates to the evolution of life, Koonin has some ideas, largely related to the battle between bacteria and the viruses that infect them, each side adapting to what the other threw in its path. That their ancient struggle has resulted in a way to alter human DNA is the leap no one could have foreseen.